If hours are easily lost in Hampton Court Palace’s halls and apartments, days are easily lost in the 60 acres of Hampton Palace Gardens. Over the centuries, many people added their own touch of beauty to the Hampton Court Palace gardens. The Wilderness garden began as orchard in Henry VIII’s time. In the 17th century it became a series of intertwining paths with a maze of tall hedges. Today, only the maze remains. The Knot garden, although laid down in modern times, replicates the Henry VIII’s original. 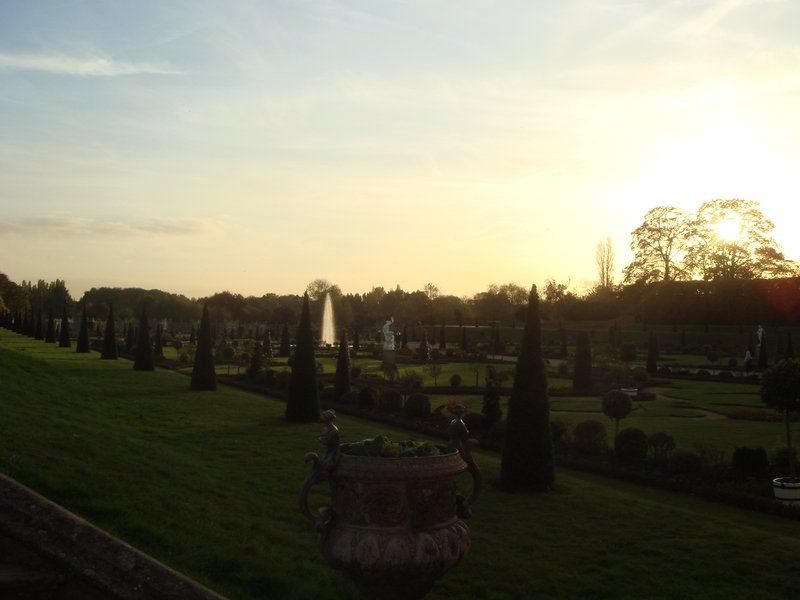 The 13 fountains and the parterre of the Great Fountain garden were the work of William III and Mary II. The Privy, established in 1702, was King William’s private garden. The Orangery was built to nurture Mary II’s exotic collection which included cacti, orange and lemon trees. 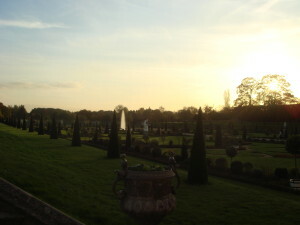 The Yew trees were planted by Queen Anne. The grapevine, which still yields delicious grapes, was planted in 1768 by the renowned landscape gardener, Capability Brown. The sunken Pond gardens which once held freshwater fish are now planted with flowers. The flower beds are Victorian and the herbaceous borders were added in 1920. The 20th century garden was converted from a horse paddock in the 1970s to train apprentice gardeners. Last but not least, the snippet of sky on the header of this Travelstripe Blog was snapped above the Rose Garden at Hampton Court Palace. Just 30 minutes by train from London Waterloo, on a picturesque tree-bordered bend in the Thames and set in 60 acres of rambling gardens, is magnificent Hampton Court Palace. 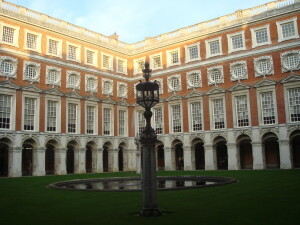 Hampton Court Palace was the home of Henry VIII and his first wife Catherine of Aragon. When Catherine was ousted after failing to give Henry a son, his second wife Anne Boleyn moved in. Henry’s third wife, Anne of Cleves, was banished to Hampton Court when their marriage was annulled and lived here, in exile, until her death. Hampton Court was also the home of Cardinal Wolsey in the 1520s, until he fell from favour with the King and was beheaded for treason. Despite the many subsequent occupants and renovations to the palace, it still has the stamp of the court of Henry VIII. The kitchens which, when the King was in residence, fed up to 800 people on the most exotic fare, are the largest surviving 16th century kitchens. The Chapel Royal was the scene of Henry’s son Edward’s baptism and of his marriage to his last wife, Catherine Parr. In the Tiltyard, which now houses a café, Henry displayed his skill with the jousting stick or watched tournaments from the towers. He showed off his athletic prowess playing Real Tennis on the Royal tennis courts which are still in current use. It was Henry who enclosed the 250 acre Home Park for hunting. Today, it is home to 350 fallow deer, as well as a golf course and the annual Hampton Court Palace Flower Show. And somewhere among the ancient spears, shields, pistols and muskets displayed in extraordinarily complex and really beautiful formations in the guard room of the King’s Apartments, there must surely be one that was grasped in the hand of the hot-blooded warrior King. Most of the rest of the Palace and gardens speaks of later reigns. The King’s and Queen’s apartments were built for the monarchs’ ceremonial and state lives. Those of King William III, completed in 1700 and furnished with magnificent period tapestries and works of art, are said to be the best baroque apartments in the world. The Queen’s apartments were originally intended for his wife, Mary II, who unfortunately died of smallpox in 1694, before they were completed. The Banqueting House, overlooking the Thames, where William held small private parties, was built in 1700. In 1837, George II decorated and furnished the private informal apartments now known as the Georgian Rooms. The Queen’s apartments were furnished and decorated for his Queen, Caroline. 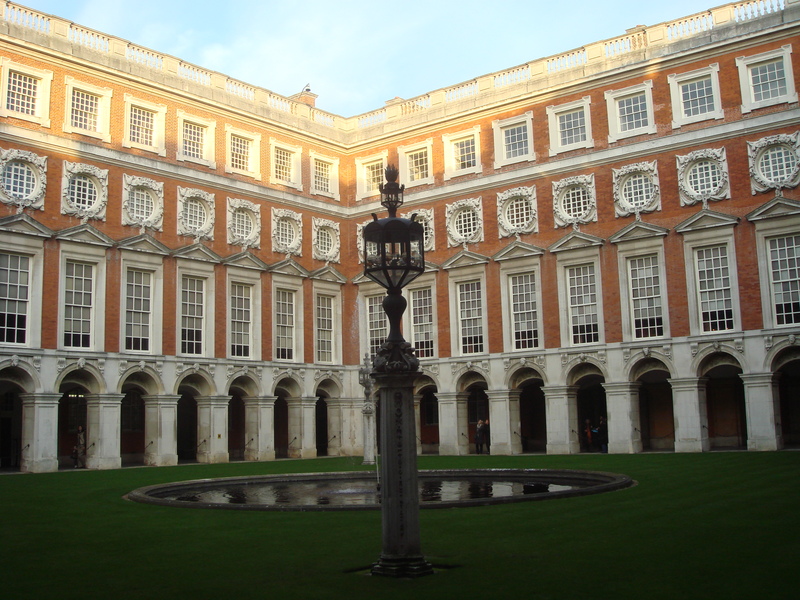 Hours are easily lost in the splendid rambling halls and apartments of Hampton Court Palace.